The latest in a long line of movies to take pot shots at American suburbia, Suburbicon has admirable intentions but ultimately proved disastrous in terms of both box office and critical response. This is a pity as director George Clooney's satire, co-written by his regular collaborator Grant Heslov and developed from an early Coen brothers script, has plenty to recommend it in terms of design and general broiling anger. If ever a movie was intended as a contemporary state of the union address, this is it. The film is essentially a broken-backed piece, exploring two separate narratives that fail to come together effectively. On the one hand there is the arrival of a black family into the predominantly white, picket-fence 1950s environment of Suburbicon, a development that ultimately incites all kinds of outrage and racial violence. On the other, we're presented with outwardly bland suburban husband and father Gardner Lodge (Matt Damon) who is in deep with the mob, a set of circumstances that leads to the death of his wife (Julianne Moore), which in turn sets up a blood-splattered, darkly comic final act that is never as pointed or as painful as it intends to be. Whatever the movie's flaws they aren't reflected in the typically outstanding and incisive score from Alexandre Desplat, marking his third collaboration with Clooney following The Ides of March and The Monuments Men. The presence of those three scores indicates that Clooney, regardless of his recent failings as a director, has an excellent understanding of what film music can do for a project and is clearly capable of extracting career-best work from Desplat. 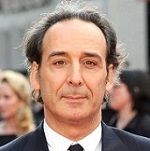 It could even be said that Desplat nails the movie's pastiche tone and satire more effectively in his music than Clooney does behind the camera. The opening of the score is designed with tongue firmly lodged in cheek, the gleefuly whimsical 'Welcome to Suburbicon' prancing along atop a bed of xylophones, snare drums and la la la choir arrangements that brilliantly nail the fakery and facade of outwardly pristine suburban America. 'Friends' continues with a similarly appealing tone, albeit in a more sincere vein, an attractive, Elmer Bernstein-esque piece for strings, woodwind and piano signifiying the hesitant inter-racial friendship between Gardner's son Nicky (Noah Jupe) and the son of the newly arrived black family, Andy (Tony Espinosa). 'When I Fall In Love' changes the tone again to a slinky, sax and snare-led jazz piece that brims with 50s period authenticity. The ensuing 'A Prayer for Rose' is similarly lovely, featuring heartfelt writing for oboe and piano that nevertheless gains a creeping sense of unease over its running time. Already, Desplat has established a tone for the score that is both instrumentally authentic yet tonally devious, with the ensuing '7000 Apples' deploying the composer's characteristic pizzicato strings and bubbling piano to signify the rot beneath the suburban exterior. 'Men in the House' marks the first truly menacing moment in the score, a lengthy piece that develops all manner of Bernard Herrmann-style discordant string, percussion and brass arrangements that resound with psychological threat. This is the material signifiying Gardner's compromised situation with the dangerous gangsters (intelligently teased during the nail-biting 'The Line Up' with its cascading woodwind arrangements), which eventually reaches explosive iterations during the score's climax. Indeed the climactic onslaught of 'Falling Apart', 'Nicky Trapped' and 'Aftermath' mark some of Desplat's most furiously dark work since Godzilla. Meanwhile the angry, driving strings of 'Mrs Lodge Called', 'Basement Games' and 'Closet Conversation' are clear evocations of Herrmann's seminal Psycho score. In-between there are plenty of other highlights including a sly, tango-inflected theme for snooping insurance agent 'Bud Cooper' (played by Oscar Isaac), reprised to alternately tense ('A Sweet Aroma') and violent ('Unlucky Bud' with its superb trilling horns) effect in a manner that embodies the score's quicksilver shifts in tone. Playing alongside this is the more innocent music representing Lodge's endangered son, Nicky, which reveals itself as a tender, undulating piano arrangement at the end of 'The Line Up' (signalling his awareness of his father's endangered position). This is further hinted at the start of 'What Did You Do?' before staccato piano and snares lead the track in a far more turbulent direction. 'Something Sad' translates the theme into pensive strings and low woodwinds although, as ever, the mood eventually drifts into darker piano chords and the air of something more violent. 'Blonde' reprises the smooth and sensual jazz tones heard earlier, although by this stage in the score it's clear the music is striking a pastiche tone designed to reflect the emptiness and moral ugliness of the movie's environment and characters. Only with the reprise of Nicky's tender theme during the deceptively tranquil 'Sunday in Suburbicon' and the lush 'Playing Catch In The Sun' do we get a sense that, outwardly at least, things have returned to normal, Desplat deploying the full force of the symphony orchestra to bridge the racial divide during the movie's climactic moments and in the process restoring a sense of human compassion. 'Suburbicon Good Night' then ends everything on the same sickly sweet, satirical note with which the score started, in the process underlying Clooney's sense of impassioned satirical rage. It's always a shame when a film score goes down with the ship - alas, given Suburbicon's critical and commercial panning, it seems this is the destiny facing Alexandre Desplat's excellent score. Truly there are few modern day composers better equipped at getting beneath the skin of a diverse range of films - to move from the likes of Birth, Harry Potter, The Ghost Writer, Godzilla and The Grand Budapest Hotel to this, all the while maintaining a consistent musical voice, is truly extraordinary. Resplendent in Desplat's characteristic mannerisms whilst also serving its slippery, troubling movie brilliantly, it's a darkly comic score that both honours its soundtrack predecessors and carves out highly entertaining territory of its own. The film score album is available at these links: Amazon.co.uk or Amazon.com.